It has taken me a while to post about my trip to Clarinda, Iowa. I ended up putting fake blogging dates on those posts so that they wouldn't all appear to be on the same day. While I was in Clarinda I would optimistically drive down to the Super 8 every night to take advantage of the super slow wireless, only to have my laptop thoroughly misbehave. Some nights I couldn't even get online. The misbehavior of my laptop continued after I came home, and then it took a really long time to transfer things over to my new laptop. I'm not really much of a computer person so all of the chores that I'm having to do just to get the new one up and running are kind of making me want to run in the other direction. The new computer keeps asking me questions that I don't know how to answer! It is a very tedious process. In a similar vein, I had decided shortly before the computer issues started happening that it was finally time for me to become acquainted with my fancy new sewing machine that I haven't used once in the nearly two years that have passed since I bought it. I lost 2 sewing machines and I especially miss my favorite sewing machine of all time - the Singer 404 because it was so basic and sturdy and easy to use. I eventually got another machine that did some fancier stitches but I always felt like I was cheating. I didn't really enjoy using it and I didn't much care for the fact that it was made out of plastic. So after the fire took both of these machines from me I decided to combine their value and get one super-duper sewing machine. It is made by Brother and can do some truly amazing things and it is really well made. But the instruction booklet is over 60 pages long. At least it has an instruction booklet, unlike my new computer. And at least the instruction booklet is so well-written that I can actually tell what the instructions mean. So far I've only used the straight stitch for a couple of projects but that was enough to get me excited about the potential of this machine. Unfortunately I'm probably not going to have time do any more sewing until we get back in our house. Then I'll be able to set up a real sewing area instead of having to move my computer out of the way. Also I have to buy all of the basic equipment again. And there's nowhere else to set up the sewing machine so I have to use the same card table that I use for my computer. Complain, complain, complain. It's all pretty inconvenient, but I'm learning a few new things and re-learning quite a few more things as a result. But I'm pretty sure that the days of sewing bathing suits and winter coats and reupholstering the car seats are long gone. These days I have other diversions. I was just looking back at all of the posts I made about my trip to Iowa. I sure seem thrilled by it all. I'm guessing it will be the only significant trip I'm going to be taking this year, mostly thanks to this unending project , so I'm milking it for all that I can. In another year I'll finally be free to get back to taking some longer trips. Finally. On the flight back home I had another chance to take a video of my bass being manhandled by the baggage guys. I guess at the end of a long day, a gigantic "99.5" pound bass trunk is about the last thing a baggage handler wants to see coming down the conveyor belt. I sort of wish I hadn't seen this, but it's good to be aware. Anyway, the trunk really is built for this kind of treatment (I hope) and there was no damage to the trunk or the bass whatsoever. Still, this is one scary video featuring one very angry baggage handler. The video from the flight on the way out was a lot less horrifying. My first cruise ship gig, which included 2 months in the Caribbean, crossing the Panama Canal several times and 2 months cruising all around Portugal, Spain, France, Italy, and Greece. I'll never forget playing out on the deck, serenading the people on land with Italian tunes as we entered Venice for the first time. A big band theme cruise with Tex Benecke, and crossing the Atlantic playing several additional big band theme cruises. A New Years Eve gig with the Artie Shaw band in Tunica, Mississippi. A few gigs with the all-female big band Diva. Four years on the road travelling all over the USA with the In the Mood show. 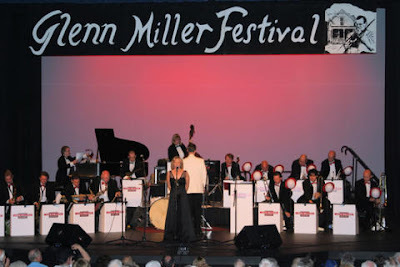 Playing with the awesome Jack Million Big Band from Belgium at the Glenn Miller Festival. I probably wouldn't have been able to do any of these things without a bass trunk, so I'm extremely happy that I made the investment. However I may be thinking twice about flying as much in the future. I've heard all of the horror stories and one of these days it will probably be my turn too. I really hope I'll be able to stop before that happens, but I'm not finished quite yet. This morning the band flew back to Belgium and I had all day to meander back to Omaha from Des Moines. First I decided to drive in the direction of downtown and I saw a really fancy building with golden domes on top in the distance. So I drove up to it to see what it was and it turned out to be the state capital building. I never expected to see such a thing in Iowa, of all places. I went in and looked around. It's very cool. Then I went down to look at the river. A few days ago it had flooded but everything seemed to be relatively okay at that point. The worst flooding was farther east, and it was especially bad in Cedar Rapids. The river in Des Moines was very muddy and turbulent and the railroad bridge was about 2 feet above the water. There were tree trunks jammed all along the upstream side of the bridge. It must be incredibly frightening to know that a flood is coming and not really be able to accurate predict how high the water will get. Having your house wash away in a flood has got to be at least as bad as losing it in a fire, and probably worse. Between Des Moines and Omaha there is an area of Iowa that was settled by a lot of Danish pioneers who have kept a lot of their old country crafts and architecture. I took backroads all the way because I had plenty of time. Many of the barns were decorated with large squares that were painted to look like quilts. I guess these might the Danish versions of the hex symbols you see on the sides of barns in the Amish areas of Pennsylvania. Sometimes the best way to escape the heat in DC is to just leave town, which I was lucky enough to do today. The clouds were absolutely beautiful. I pretended they were big globs of snow and it really cooled me off. Later I got a little bored. Fortunately they brought snacks and I was able to amuse myself with that. As you can see, I'm easily amused. At the transfer point in St. Louis I was able to take a video of my bass coming out of the cargo hold. As usual it was lying bridge side down. Fortunately the case is designed for that type of treatment. My bass has flown about twenty times without incident, but I still worry about it.